Performed live on an electronic drumkit, Real Latin is a collection of dance oriented Latin MIDI grooves created to inspire and move you. The world of Latin music has continued to gain popularity over the years as an exciting form of entertainment that has crossed over and blurred the lines between different styles. True Latin music does not normally include a drum set - Real Latin offers MIDI grooves that were adapted to the drum set that will make you move in your seat. For this offering we concentrated on the drum set instrumentalists that have pioneered the art form and drew inspiration from their playing to create this extremely musical collection. Platinum Samples and John Emrich are two of the foremost producers of drum samples in the world, with over 50 years of experience in the professional music industry, and now they have turned their attention to developing MIDI Grooves. 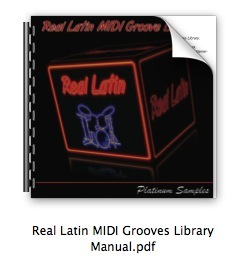 Real Latin was recorded by John Emrich on a Yamaha DTX900 electronic drum set. Optimized for 1 Kick, 1 Snare, 3 Toms, 1 Hihat, 2 Crash cymbals, 1 Ride cymbal & 1 Cowbell.